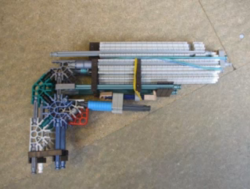 This is based on somebody else's knex sliding pistol. I have improved the trigger, made it so the sliding part cannot pull back so far it comes off, improved the handle and the power. For this you can use almost anything: grey rod, red rod, yellow rod, blue rod, white rod, green rod. You can even make it like a shotgun by having 5 green rods firing at once( I recommend trying this).Please be careful with this gun as this is as dangerous as a sharp knife in the wrong hands. To build only the best knex guns.